Parmesan zucchini sticks are baked to perfection and full of cheesy parmesan flavor. A simple side dish or appetizer, served best with marinara sauce for dipping. A week or so ago I shared a list of the finger foods Lily has been enjoying on the regular. Add these parmesan zucchini sticks to the mix my friends. She pretty much slobbers on the sticks and licks off all the parmesan cheese [who wouldn’t?!]. A girl after my own heart! You’ll notice from the pictures that these parmesan zucchini sticks aren’t precisely cut the same size or coated evenly with parmesan cheese. Momma doesn’t have time for that now that little sis is on the move. But I can tell you that if you cut the zucchini relatively the same size they’ll turn out just fine! Just don’t forget the extra sprinkle of parmesan cheese at the end. You can, of course, adjust the seasoning [add more Italian seasoning or perhaps some panko breadcrumbs]. But I was working with what I had on hand and what my crew likes. Everyone gave these two-thumbs up— yep, BOTH toddlers! Don’t tell them I knew we’d have a winner on our hands because this recipe is very similar to my parmesan squash rounds—- lots of cheese and flavor. 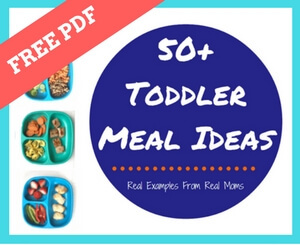 A must-have for any toddler recipe. Enjoy! Preheat oven to 375. Spray nonstick spray on a cooling rack and place on baking sheet. In a resealable plastic bag, add zucchini, oil, Italian seasoning, and parmesan cheese. Shake until zucchini sticks are evenly coated. Place zucchini onto cooling rack. Sprinkle with reserved parmesan cheese. Bake until tender, about 15 minutes. Then broil for 2-3 minutes.